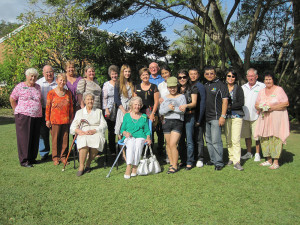 Bribie Island Branch was established in 1966 and for many years it was the only Community Service organisation on the Island. The focus of all work done by the Branch has always been on helping and caring for people and this is one of the main reasons why it has been such a strong Branch over the past forty-seven years. Members of the Branch give excellent support for the work done at Coungeau House. They serve on the Management Committee, they support many of the activities at the House and they give financial support for specific items needed to maintain the House in good order. For many years they ran a Book Exchange which was used by many people on the Island and this was a good fundraiser for the Branch. In more recent years one of the main projects is ‘The Old Friends Meet’ when as many as one hundred elderly people are transported to Coungeau House where they meet in the hall, enjoy good fellowship and a sit down afternoon tea. Local music groups give their time and talents to stage a concert and the hall is always decorated to make it a cheerful place. Another important event on the Bribie Island Toc H Branch calendar is the World Chain of Light. This is always well supported by Toc H members, their families and representatives from various community groups on the Island such as the Women’s Auxiliary of the RSL and the Country Women’s Association. Meetings of the Branch are held at Coungeau House in Banya Street at 9.30am on the fourth Monday of each month. The Branch extends a warm welcome to anyone who would like to join the Branch or who is interested in finding out more about Toc H and the wonderful work it does on Bribie Island to help people live fulfilling and worthwhile lives. If you are interested in contacting the branch please call (07) 3408 1435.